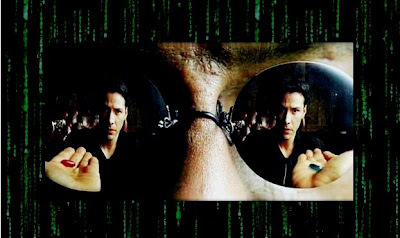 Take the red pill and you enter a whole new world. Pick up a book and you do the same thing. There used to be a kids TV programme when I was a kid called, Why Don't You Just Switch Off your Television Set and go and do something Less Boring Instead , which I thought was an interesting concept because if you followed their advice you couldn't watch the programme. why don't you just shut down your computer for now and go and read a book? and yes, yes I know that e-books are getting pushed by Pan Macmillan and Penguin at the moment but they're tasters - marketing tools to allow you to sample before you go for the real thing - few people will read a whole book on their screens. So shut down the PC - grab that book, free your mind and enter a whole new world. Just come back another day okay? Say Friday - News coming at The View From Here Friday.